A natural, unaltered blind that worked twice, one buck taken there is now on the wall. Most of the whitetails I saw while hunting last November were out in front of three of six new blinds that I used: one blind consisting of natural unaltered cover and two made before the opener from dead branches lying on the ground. [Originally published March, 2013.] Most of the deer seen by my son John and his son, Jimmy, were seen at three of the eight blinds they used: one natural, unaltered cover and two made from dead branches. We made sixteen new blinds in October, but some were not used because of adverse wind directions. Many were constructed near sites and trails frequented by mature bucks (revealed by their tracks, droppings, antler rubs and ground scrapes). Others overlooked feeding areas favored by does with fawns, places to watch for bucks after breeding begins. Results were mixed but we expected that. We were experimenting. 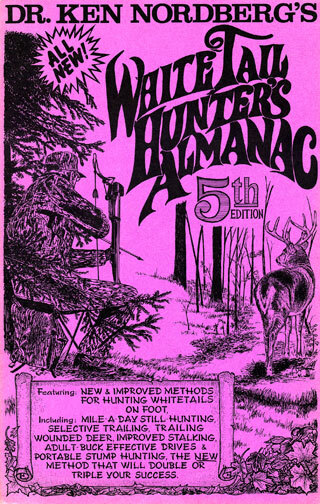 My experimenting with blinds dates back to 1960 when I first began bowhunting. [A separate article uses the date of 1961.] Tree stands were unknown back then. Since then I have made hundreds of blinds using all sorts of materials including: grass, hay bales, cornstalks, tree branches (uncut and cut), evergreen boughs, dead and live brush and trees, camo netting, dirt (pits) and rocks. I am still trying to discover the perfect blind, one that can fool mature bucks every time. The "every time" part has proven to be as elusive as mature bucks. Oh, we've made progress over the years, improving from making never-productive blinds to quite a few that were productive the first they were used and sometimes again a year later. Only one in the last 23 years did better. Why make blinds at all? 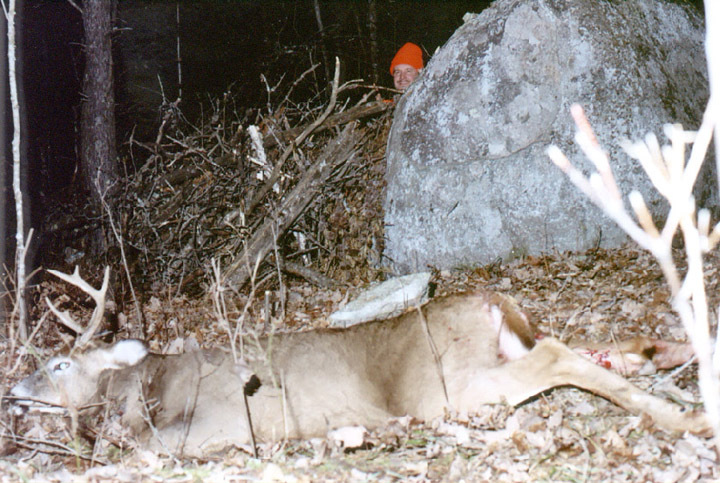 My sons and I continue to make them because we not uncommonly find sites that appear especially favorable for taking big bucks but lack cover adequate enough to hide our bodies and movements at the best locations for our stand sites. For us, ever reluctantly ignoring any spot where taking a mature buck seems likely, so the only practical answer for lack of adequate cover is a blind. At this great location all we had to do was add to a natural brush pile that was lying next to this boulder. That smiling face belongs to Doc's son John. 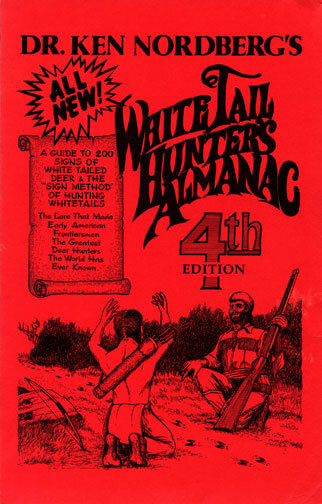 The whitetail is the 2-1/2 year-old buck he shot at a distance of 3 feet. (He couldn't judge its size ahead of time since it came into view so close. He is more proud of the distance than the size of the buck.) In this picture, John is looking upwind. The buck was traveling from right to left. 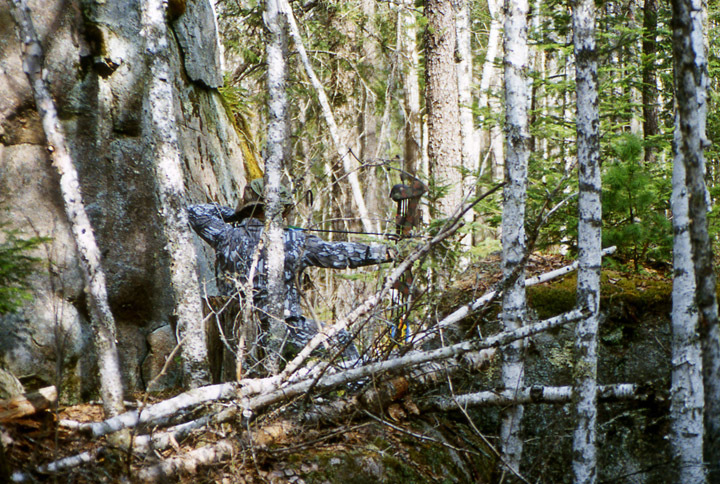 In other words — even though he was completely hidden by the boulder — John was only about 45° from being directly upwind of the approaching buck! All of our most recently made blinds were made from dead, uncut branches that were lying on the ground, often laced with boughs from downed evergreens. We use uncut branches instead of cut branches because we have learned long ago many older bucks shy away from any notable number of bright, freshly cut ends of branches or tree trunks, including any in shooting lanes. We select stand sites with natural openings to sites or trails where we expect to see deer. Because half of our hunting area was logged a year ago, most of our new blinds were located along northern and eastern perimeters of various parts of clearcuts (expecting customary south and west winds), especially where grasses and woody browse plants such as red osiers and red suckers growing from sugar maple stumps and deer tracks and droppings were numerous. Many of our new blinds were constructed right at edges of clearcuts. A few were placed in forest cover up to 30 yards back from edges of clearcuts and a few were made overlooking forest rails frequently used by mature bucks and other deer traveling to and from clearcuts. My two other sons also made some blinds. Two were constructed along a trails upon which seven bucks, 2-1/2 years of age or older, were photographed by a trail cam in October (we got four of them at sites one-half to a mile away). Despite our care in constructing our 16 blinds — making certain each had an unaltered, solid, natural background; fairly solid, nose-high (for a seated hunter) screening cover in front; and blended well with adjacent cover (not obvious in appearance) — we saw no deer at more than half of our blinds adjacent to clearcuts. My two best man-made blinds (where the most unsuspecting deer were seen) had ideal approach trails, almost guaranteeing I would not be seen and heard by deer feeding out in the clearcut. One coursed through 100 yards of very dense evergreen cover right to the blind, built behind the huge trunk of a fallen pine, 30 yards back from the edge of the clearcut. 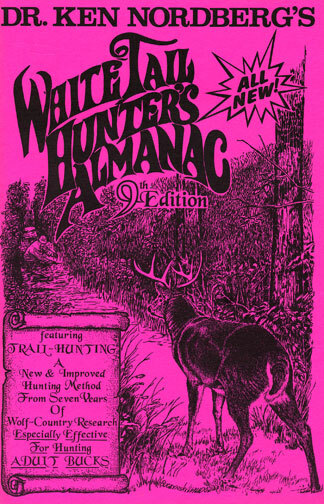 My other best blind, also located 30 yards back, has an approach trail that courses through dense forest cover behind a steep-sided ridge where the beam of a flashlight can be used before first light in the morning without being seen by deer feeding in the clearcut on the opposite side of the ridge. My third best blind (where one or two unsuspecting deer were seen within 50 yards each time I went there) was a make-do, natural blind at a never-used-before stand site found early one afternoon on day five. Untouched natural cover there very effectively hid my body while seated on my stool about 15 yards back from the edge of the clearcut. Unfortunately, not having an ideal approach trail, I could only use it in the afternoon when I could be certain no deer were presently in the clearcut. Finding a better approach trail will be a top priority next fall. 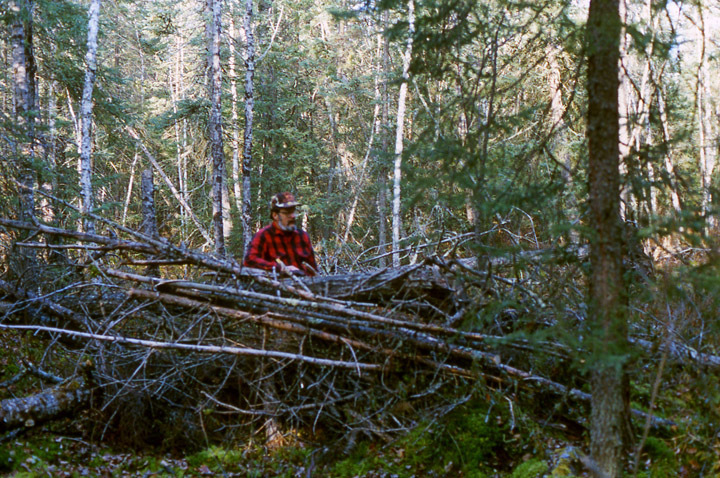 In this photo, Doc is adding branches to a natural U-shaped brush pile. This notoriously promising ground blind is located next to a major whitetail deer trail hub and has had numerous close calls with big bucks. It just doesn't have good cover directly behind the where the hunter sits. One or two trees directly behind where Doc is standing would have made it ideal. Some of our newly constructed blinds are one-sided, dead branches piled against one or more tree trunks or a fallen tree to form a wall, nose-high to a hunter seated behind it. A one-sided blind is generally adequate where it is unlikely a deer will approach from either side. Where approaches from sides are likely, we make U-shaped blinds, with the entrance in back. To hide our exposed heads, we wear camo head nets with single, oblong eyeholes under our camo blaze-orange caps. A sparsely branched evergreen bough placed on top of the blind adds an effective touch. Some of our blinds are "stop-short" blinds, made to temporarily hide a seated hunter while waiting to make certain deer are not currently located between the hunter and an intended stand site ahead. Several of our stop-short blinds have been more productive than the intended blinds. Last November we all saw deer while seated at many of our new blinds, but only two bucks — a spike seen several times and the eight-pointer I missed on day three. Two of our bucks, one now being mounted, were taken from natural blinds at never-used-before stand sites. Our two other bucks — one also being mounted — were taken from portable tree stands at stand sites selected three weeks before the opener. This nice ground blind location was spotting during scouting. The ground where the stool and hunter's feet would be located needed some cleaning up. Otherwise, very little work — other than noting its location — was required. 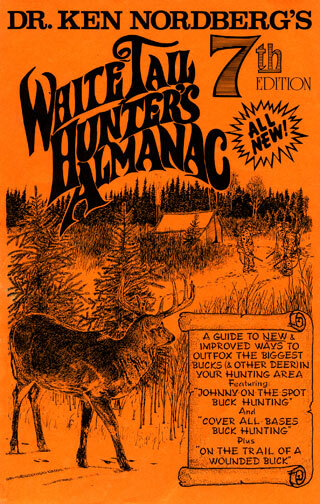 As much as I like to construct and use blinds, I must admit, all but one of the 18 whitetail trophies displayed in my office — mounted heads, skulls with antlers and sets of antlers — were taken at never-used-before ground level stand sites with natural, unaltered blinds and no prepared shooting lanes. 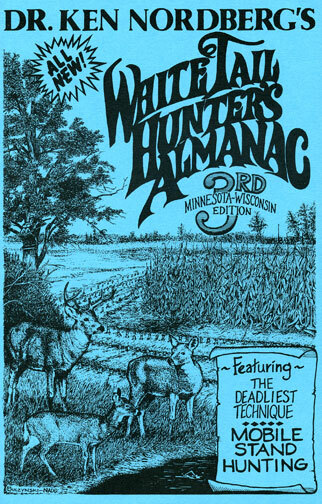 The reason such blinds became a major part of my buck hunting during the past two decades is, I've watched too many really big bucks approach, suddenly freeze in cover, stare up to 15 minutes in my direction where I was depending on a man-made blind and/or other altered cover to keep me from being identified. Then only to see them suddenly back away and disappear, never to be seen again at those stand sites. I continue to use man-made blinds during the first two or three days of a hunting season, but rarely after that because by then older, experienced bucks have made dramatic changes in habits, behavior, locations in breeding ranges and trails they use. I can therefore no longer depend on blinds at stand site locations based on deer signs discovered before the hunting season began. From day two or three on, I only stand hunt (using my backpacked stool) near trails and sites where I find very fresh signs made by mature bucks, discovered while cruising non-stop along pre-selected widely looping, connecting deer trails between 11 a.m., and noon daily (while deer are bedded). Upon discovering such signs, I very rarely find any of my prepared blinds at just the right spot. 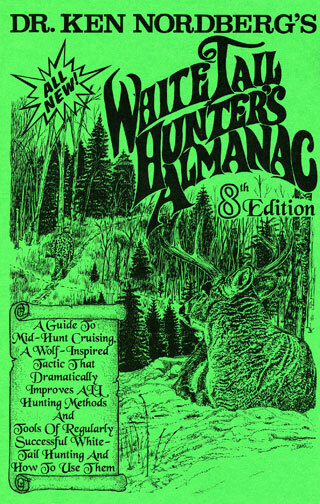 I must therefore search for and use natural blinds at just the right spot, avoiding altering or very minimally altering anything that might arouse the suspicion of an approaching buck (only snipping off the tip of a branch or two that might interfere with the flight of my bullet). This notorious location is a boulder Doc calls, "Bunyan's Marble." (Massive boulders in this area were deposited by glaciers during the last Ice Age.) It is an excellent bow hunting location at a crossroads of the "Rut Route" traditionally used by the current dominant buck that lives in this area. Some of my most memorable blinds were no more than deep grass and a small evergreen, upturned roots of a fallen tree, a boulder and a patch of dense saplings with a two-foot-wide popple trunk to lean my back against. Sometimes I feel terribly exposed where I sit. 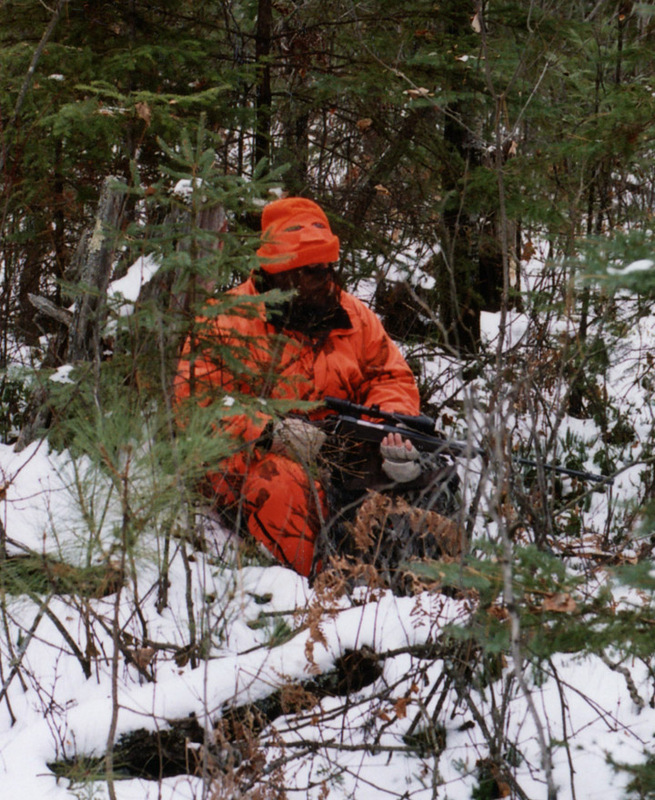 Then depending on sitting very still and my backup blind, my camo blaze-orange outer clothing, my camo head net, camo cap and camo gloves, to keep me from being spotted by approaching deer. Here John is sitting on a backpacked stool, leaning against a tree stump. The location is only 100 yards west of Bunyan's Marble — shown in the previous photo. (Notice, there is no cover directly in front of John.) This location was spotted by John during fall scouting and simply marked on his GPS. (Other than, snipping a small branch, moving a fist-sized rock and leveling the mossy ground for his stool, no other prep was needed.) 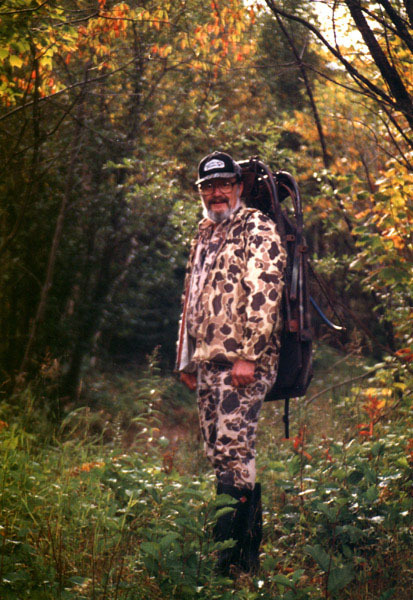 His "shooting lane" was limited by small evergreens to his left and right. He had dense cover directly behind him, and a traditional browse feeding area directly in front of him. He sat here that day because of wind conditions — he is looking into the wind — and because there were fresh tracks and droppings from the dominant buck and its doe along the Bunyan's Marble trail 5 yards in front of him. Notice his camo mask. His eyes are barely visible beneath the lower edge of his blaze orange ski mask. Only his fingertips displayed human skin. His feet (which he admits he wiggles sometimes) are hidden by a 4' x 4' scrap of lightweight, non-blaze orange, duck hunter camo material. During mating, the doe and buck literally ran out in front of him. They did not display any signs of recognizing him even though they were just 30–40 yards away and looking in his direction. All of these critical details came together when he took his biggest trophy whitetail buck. Imagine how John's shape would have appeared to the deer. While somewhat out in the open, there is no evidence of the classic human form. 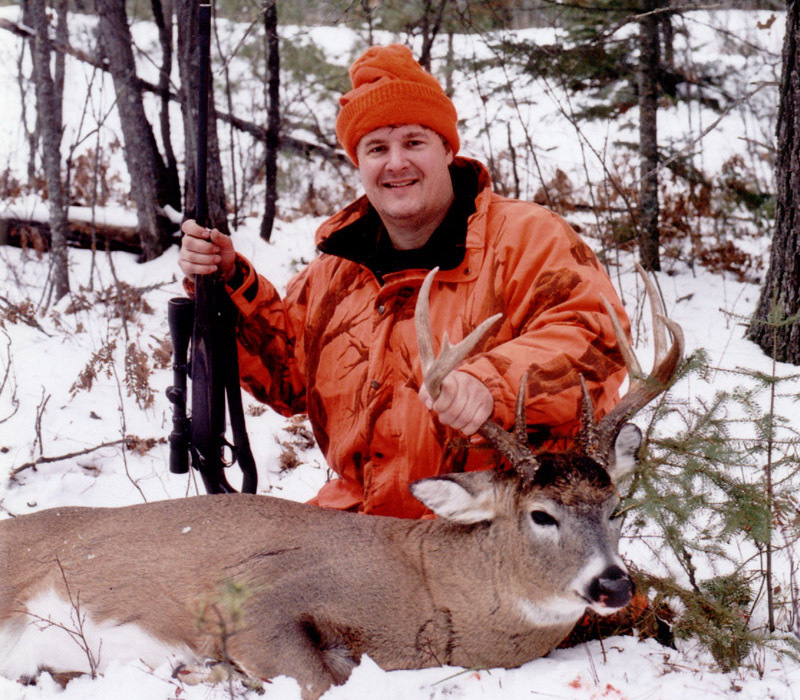 The dominant buck John took from this ground blind along Bunyan's Marble Trail. 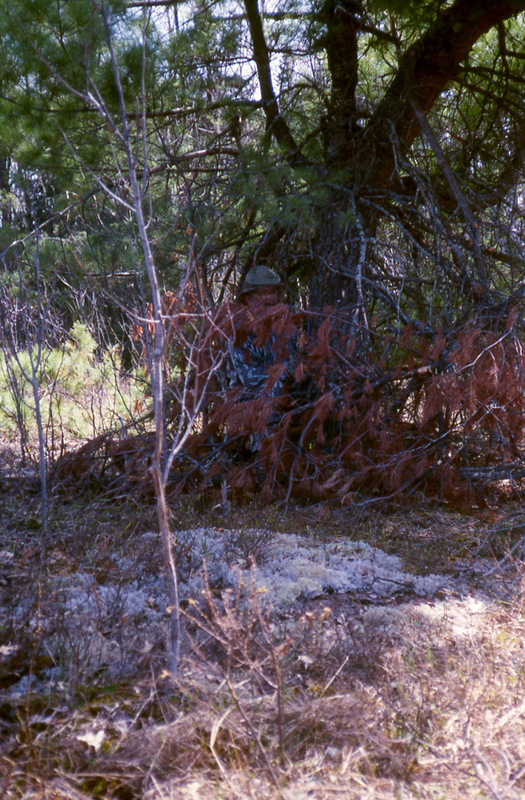 Sitting very still where not sky-lighted or snow-lighted, and no skin showing, can make you nearly invisible to whitetails even where cover is sparse. 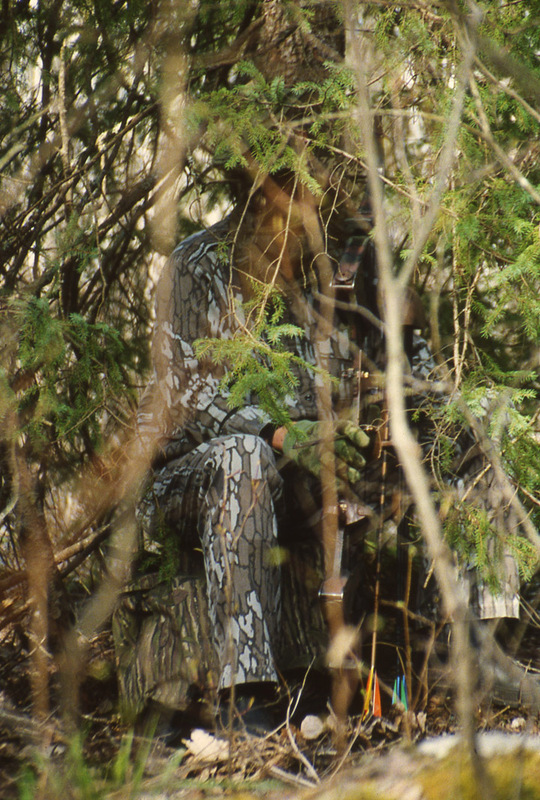 Keep in mind, however, whether seated (always sit) behind a well-constructed blind or a mere six-foot pine, always remain very still while one or both eyes of a nearby whitetail are visible to you. Eyes of whitetails are extremely sensitive to motion. Don't ease your rifle through or over the top of your blind (or raise your bow) until the nearby whitetail's head is facing away or hidden by intervening cover.